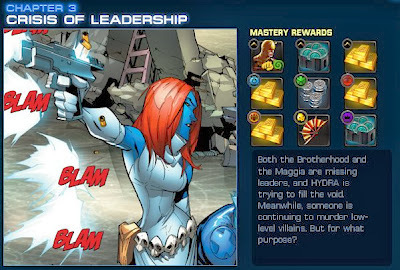 ooh neato: Marvel Avengers Alliance: Season 2, Chapter 3 Released... Patch Notes! Marvel Avengers Alliance: Season 2, Chapter 3 Released... Patch Notes! Chapter 3 of Season 2 of Marvel Avengers Alliance is out, revealing more of the story behind the Circle of Eight and dangling the gold Original Daredevil costume as the reward for finishing all the Chapter's tasks. Desiring to have an heir, the Red Skull indoctrinated and trained his daughter mercilessly, hammering her into the shape he wished. He got what he wanted: Sinthia Schmidt is just as brutal and immoral as her father. In addition to the below changes, damage done by these heroes has been adjusted. Hidden Potential now also grants Stored Energy when Ms. Marvel is struck by energy attacks. Stored Energy increases the damage of her attacks by 20%. Stacks 3 times. Staff of Legba’s heal tag has been replaced with the buff tag. Black Widow’s real name was incorrect and has been fixed in her bio. Fixed an issue with Heimdall recharging too often in PvP when he doesn’t have access to his Level 9 ability.